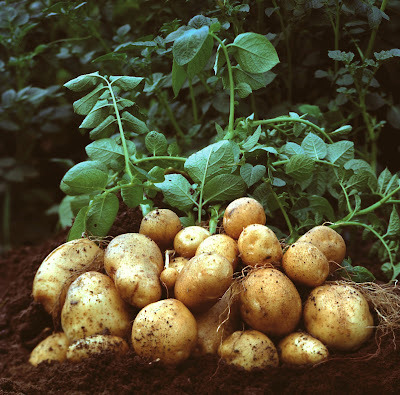 Potatoes are without doubt one of the simplest crops to grow. The trouble is that there are so many different varieties to choose from and every year the risk of damage from potato blight seems to increase. However, get it right and you will have an excellent and flavoursome crop that has required minimum effort to bring to fruition. You can just did a small trench and plant them straight off but 'chitting' your potatoes you can encourage a larger and earlier crop. But what is chitting? While soil temperatures remain below about 10 degrees Celsius not much will happen as the potato - a modified storage organ - will be in a state of natural dormancy. Left to their own devices, by the time the soil has warmed up sufficiently to break the dormancy period and begin the new season growth the majority of potato plants won't be ready to crop until the late summer or even autumn. The reality of this growth cycle means that we need to 'force' the seed potatoes into growth artificially by introducing light and heat - normally provided by a well lit room. This stimulates the production of new shoots and kick starts the potato out of it normal dormancy and reduce the time until cropping from anywhere between 1 and 2 months. This is what is known as 'chitting' or sprouting. You can buy seed potatoes from as early as January but it is probably better to wait until the beginning or middle of February before you begin chitting. 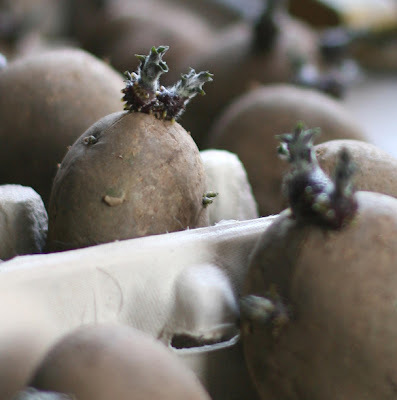 Put the seed potatoes into a box where they can be supported in an upright position - cardboard egg boxes are ideal for this – and place them indoors into a light and airy position. During this time they will require a cool temperature of a little over 10 degrees Celsius. Position them so that the end which has the most eyes (dormant sprouts) are uppermost and the 'stalk' end where they were severed from the parent plant is at the bottom. The new sprouts will form in a couple of weeks and as mentioned before its good practice to remove the weaker sprouts leaving four of the strongest to continue. 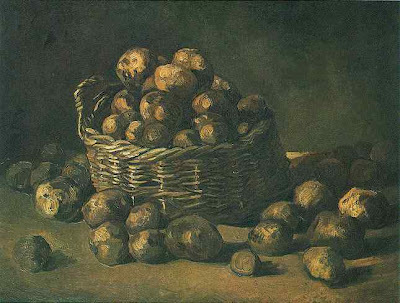 As a general rule of thumb it will normally take about six weeks to chit a batch of potatoes. 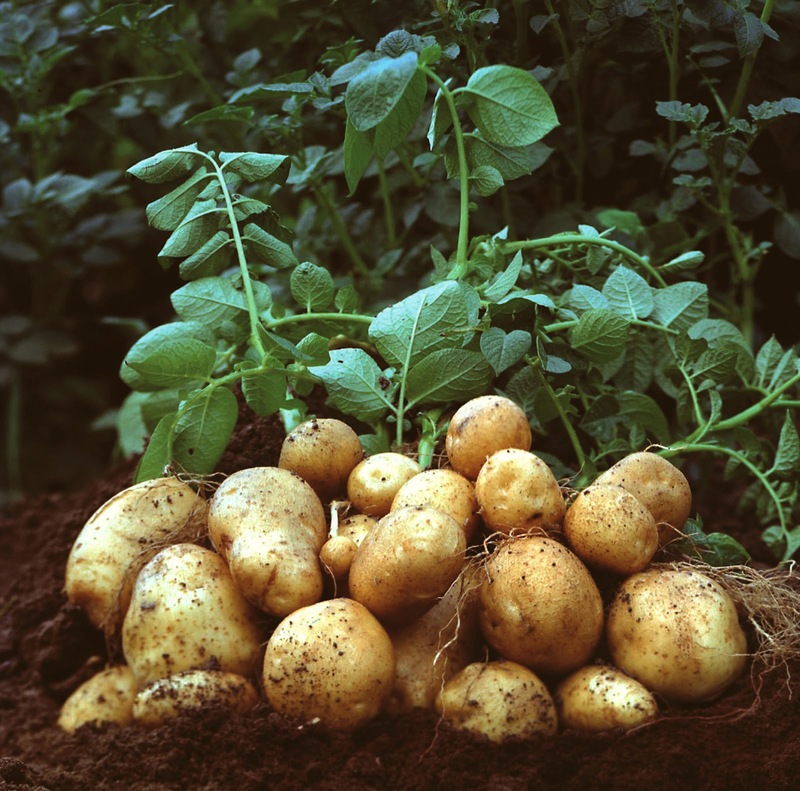 Potatoes grow best in rich soil containing plenty of well rotted manure or compost. Do not use fresh compost as this will encourage slug damage problems and do not lime the soil as this can cause scab blemishes on developing tubers. Planting times are not critical but will be dependant on weather, soil conditions and regional variations but below is a general guide. Consider using an application of pelleted, high potash fertiliser before planting your seed potatoes. A 3kg bag should be sufficient to plant 60 tubers, using 50g (just under 2 oz) per tuber. 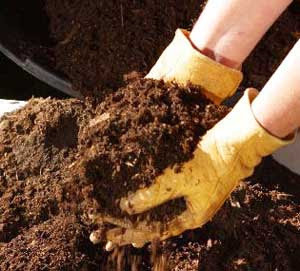 Its application is a matter of personal choice, and to a certain extent will depend on the condition of your soil. You can incorporate 50g in each individual planting hole (as with any fertiliser it should not be in immediate contact with the tuber to avoid scorching), or you can incorporate 25g when planting and another 25g when first earthing up. If you plant in a trench instead of using a dibber or a trowel, then you can scatter the pellets along the trench or leave until you earth up. 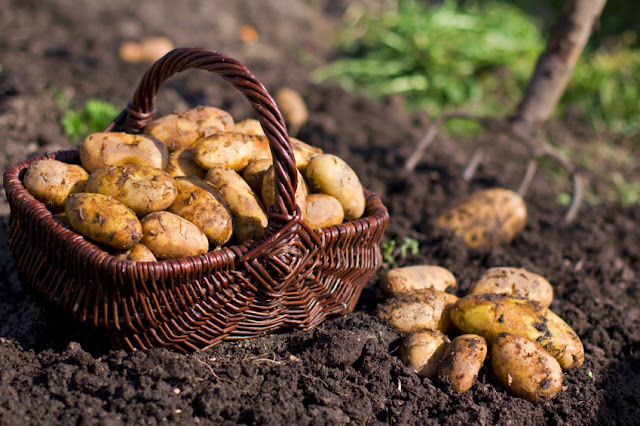 Potatoes will grow best in slightly acidic soils which can be seasonally created by applying sulphur to the top of the potato ridge after planting. Applying sulphur maximizes the yield and deters skin blemishes like Common Scab. Most importantly protect emerging shoots from any frosts by carefully drawing soil over the shoots. Frost will blacken the shoots and delay the production of mature tubers. First and Second Earlies will require plenty of water during prolonged dry weather especially when the tubers are starting to form. Earth up regularly as the plants develop. Start to harvest First Earlies as 'new potatoes' when the plants come into flower, although not all varieties freely flower or flower over an extended period. Therefore, a more reliable method is the number of weeks from date of planting. As a guideline, allow 10 weeks from planting for First Earlies, 13 weeks for Second Earlies, 15 weeks for Early Main crops 20 weeks for Late Main crops. Lifting times will also depend on the growing season, weather conditions at harvest time and the size of tuber you want. Tubers will generally become larger the longer their growing period. Maincrop varieties are usually left for at least two weeks after the leaves and haulms (stems) have withered, to allow the skins to set. Given the UK climate, I would recommend planting 2nd Cropping Potatoes in the first week of August. The absolute latest that you should be planting these seed potatoes is by the end of August. If planting in a protected environment (e.g. in a polytunnel or greenhouse) planting can be delayed by a week or so at the most but tubers must be planted by the end of the first week of September. Planting any later than this is likely to produce disappointing results. If planting is to be delayed from receipt of the tubers, ensure the tubers are stored in the refrigerator at no lower than 4°C until planting. 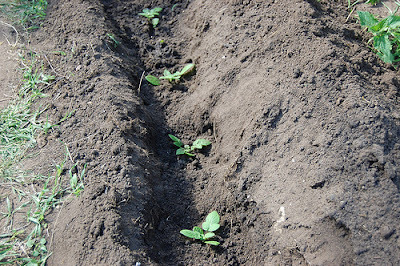 There is no need to pre-chit the potatoes - this will happen quite naturally after planting. 'Ping-pong ball' sized tubers should be ready for harvesting approximately 10 to 11 weeks after planting. Tubers can be harvested as required, with the others being left in the ground. Cut down the haulms (stems) with secateurs to just above soil level as the leaves wither/yellow or if they show signs of blight and protect from frost. We suggest covering with a thick layer of straw and/or sacking. These can then be lifted at Christmas time. The only potential problem with leaving them in the ground for this length of time is that they will be more susceptible to blight and pest attack (e.g. slugs, wireworm) - the longer they are in the ground, the more possibility there is of being exposed to these pests and diseases. For storing varieties, leave the tubers on the soil surface for a few hours to dry and cure the skin before storing in hessian sacks or in paper in a dark, cool but frost free place. Avoid polythene as potatoes will sweat and rot. For related articles click onto the following links: HOW CAN YOU TELL WHEN TO HARVEST POTATOES? May I use your photo of potato plants on my website, www.sciencemusicvideos.com? It will be used in a tutorial about biochemistry, and I'll be talking about how potatoes are made of starch, which store energy from photosynthesis.